In an age of atrocious brutality, Owen Roe was regarded by friend and foe alike as a humane and decent military commander. He was also non-sectarian in the conduct of warfare. Almost his first act after arriving in Ireland was to put a stop to revenge attacks on Protestant planter families. His last act was to lead his army from Co. Monaghan to Derry, to rescue the (Protestant) people of that city from a lengthy siege by Royalist forces. Although feted by Derry’s Governor Sir Charles Coote as a saviour, the raising of that siege is never celebrated, although it was actually lengthier than the famous “Apprentice Boys” siege of 40 years later, still commemorated in the annual marching days in Northern Ireland. Nor did it prevent the same C. Coote from executing in cold blood, less than a year later, Col. Henry O’Neill, only son of Owen Roe and his wife Rosa O’Dogherty. Perhaps the N2 roadway, which is planned to be upgraded at the cost to taxpayers on both sides of the border, and which runs from Monaghan to Derry, approximating the route Owen Roe and his men marched to save the city, could be named in his honour. His wife, Rosa was a daughter of the Lord of Inishowen, Donegal and a grand-daughter of the last king of Ulster, Shane “The Proud” O’Neill. As a young wife of the brother of the Earl of Tirconnell, Caffar O’Donnell, she was among the nobility who sailed from Rathmullen in the “Flight of the Earls”, 1607. She was the only member ever to see Ireland again. Her husband died in Rome and later Rosa married Owen Roe. They lived for some years in Germany where he commanded the garrison in the strategic town of Rheinberg, and she later lived with him in Arras, where he was governor, at the end of his Spanish career. Meanwhile she was his chief, confidential aide and manager of his political and diplomatic center, their house in Brussels, described by English spies as the European center of Irish conspiratorial plotting. From there she assisted in his communications and negotiations with the Gaelic leadership in Ireland and abroad, and with European governments and leaders, such as Cardinal Richelieu, Prime Minister of France, the King of Spain, the Pope, the Archduke of the Spanish Netherlands, and others. In these activities he and Rosa received close collaboration from some Irish priests, notably John Colgan, another Inishowen person and contemporary of Rosa’s and later the publisher of the Annals of the Four Masters. 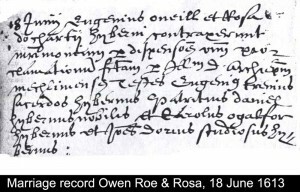 Rosa’s brother Ruari O’Dogherty and her son Hugh O’Donnell were both officers in Owen’s regiment and were both killed in battle, Ruari at Flerus (1622) and Hugh at the siege of Breda (1625). Her nephew, Major Owen O’Dogherty was killed alongside her son Henry O’Neill, mentioned above. Rosa died in 1660 and was buried in the chapel of St. Anthony’s Franciscan Convent, Louvain, in the most prominent position of all the tombs there, under the floor of the chapel, inside the altar rails, reflecting the reverence in which she was held by the Gaelic nobility of the time. Owen Roe died in 1649 and is buried in an unmarked grave in the old Franciscan church in Cavan town, traditional burial place of the O’Reilly clan, his cousins. 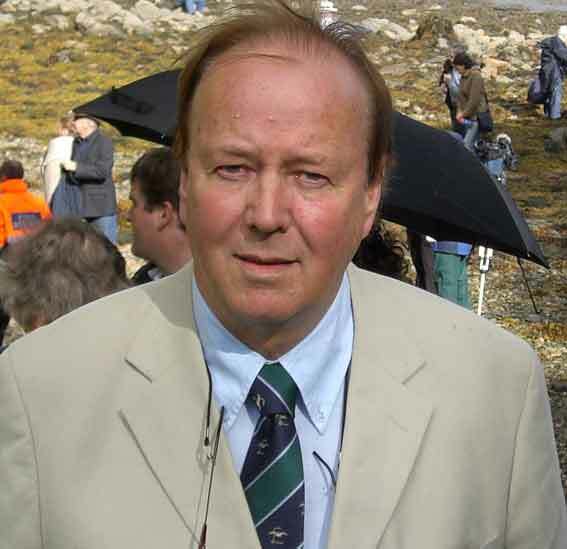 The joining in wedlock of Rosa O’Donnell-O’Dogherty with Owen Roe O’Neill represented a uniting together of the two most powerful aristocratic families in Gaelic Ireland at that time, O’Donnells and O’Neills, then, of course, in exile and never actually to regain their lands or their status. It was, nevertheless, an occasion of great joy for the Irish community, the inauguration of a leading family in the Irish Diaspora. It took place, I am happy to announce, in St. Jacobs Church, Louvain, on June 18, 1613, 4oo years ago today. June 18. Don Eugenio O’Neill and Donna Rosa Dogharty, were joined in marriage, with special permission from the Archbishop of Mechelen, and witnesses were Eugenio Freeney, an Irish sexton, John Dorins, an Irish student, Charles Gallagher and Patrick Daniel, Irish noblemen. My cousin Laurence forwarded your last email exchanges to me and gave me the address of your blog. I have been very interested in your notice related to Owen Roe and Rosa’s life and marriage. My brother Kilian and I have been making historical and genealogical researches for several years regarding the French branch. Among other things we found a document telling the siege of the city of Arras in 1640 in the French national Library. I could show it to you if it might be of any interest to you. 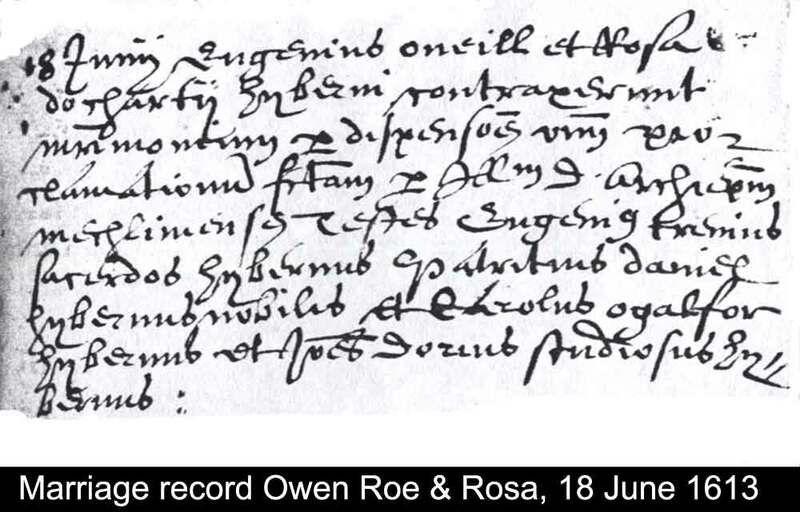 As for me, I am looking for any available details on Owen Roe’s life in france and spanish netherlands. I am convinced that it could help us better understand the circumstances of our own family’s set-up in France in the mid-17th century. So if you could bring us some knowledge on that period it could be of great help to us! I am very looking forward to hearing from you.